We serve you complete nutritious meals just when you are beginning to feel hungry. Adding a dash of love, our not-so-secret ingredient, we offer you the ‘Ghar ka Khana’ experience. At Raj Caterers, the terms delicious and healthy are not antonyms. Raj Caterers offers, pure veg & non veg Pack Food service to you. 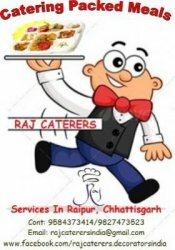 In addition to our healthy food Raj Caterers also provides bulk Pack Food service at Offices&Industries, Travel or Picnic, Institutional Functions: Like Seminars, Conference Meeting & Kids Birthday Party a cross Raipur. In this format, we cater meals in bulk for an entire office staff / Employees.